The time has come to unveil my new identity. I am not talking about an elaborate Halloween costume, I am referring to the new design is casual identity. 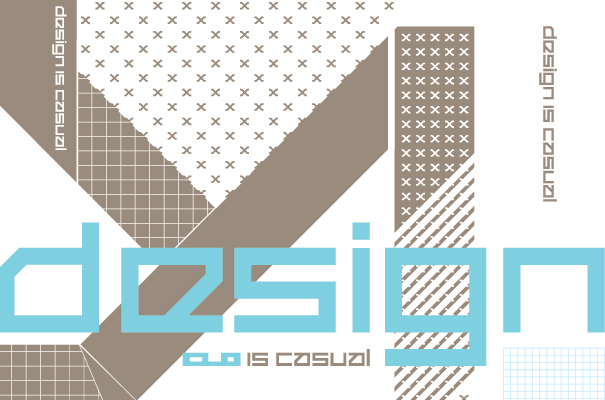 Thanks to Ronald and the non-lethal guns at anonymousUNITED for creating a fine usage/arrangement of elements, and solidifying the first official logo for design is casual. A poster will accompany the package later this month. This news comes with perfect timing, in parallel with the recent unveiling of Adobe CS4, and in a few days, the next generation of Apple notebooks. “This logo signifies the design is casual effort to be leading in innovative experiences, while at the same time remembering it is about enjoying life and relationships. With this logo behind the work, I will be able to create and promote this message and create projects that enhance the interactive perceptions of both digital and meatspace life,” Bruce said.